Sustainable, handcrafted and eco-friendly. Got your attention yet? Well, Buna is all these rolled into one. None of Buna’s products come at the cost of unhappy factory employees (or the environment). 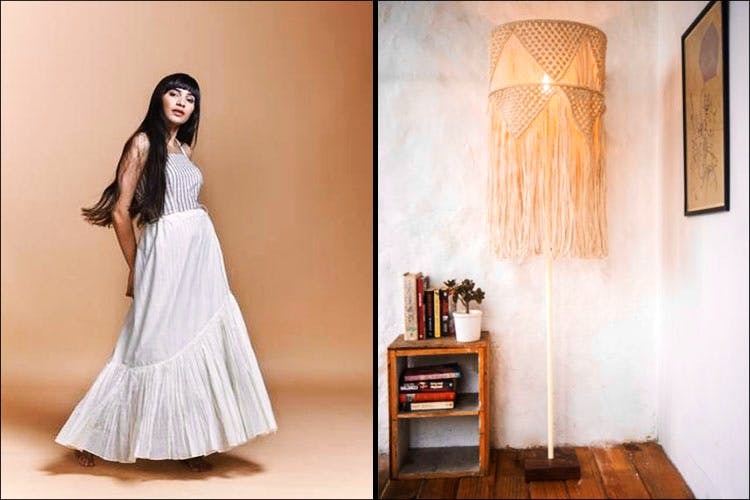 If these ideas resonate with you, you’ll love their hand-knitted macrame lamps and billowy monochrome dresses. Proudly reinventing khadi, Buna takes pride in keeping its irregularities and rustic character alive. Nothing is slick and nothing is clinical in this brand’s design process. It decidedly takes a longer route, and we’re happy to see a collection that’s literally all heart (and minimalism). The clothes are a unique marriage of traditional techniques and contemporary silhouettes. They strive to reduce waste at every step of the design process, and the head maker/founder, Pallavi Shantam, looks like a creative person from a simpler era. There’s no fuss about the clothes she creates together with the craftsmen and, if it were up to us, we’d go crazy buying everything. We have a soft corner for the long, black dresses and romantic maxis in their collection that look like they were made for a spring time picnic in the park. We’ve seen quirky, we’ve seen edgy and we’ve more than seen the industrial chic. What we haven’t seen, though, is something as stark and stunning as this. Their experiments with macrame and crochet result in a range of lamps that remind us of the beach apartment of our dreams, and, when pitted against an uneven white wall, they’re #InstagramGoals. The collection has so many beauties in different shapes and forms. When you bring one of these home, you’re also supporting the crafts communities in Meerut. So, yes, there’s a whole lot of good that’ll come your way when you shop here. The pricing is a bit steep. But, truth be told, we’d rather invest in a statement piece at Buna because it’s going to make us feel better about the world at large.